Videos of the presentations are now available here! A version of this story originally appeared in Alberta Innovates – Bio Solution’s Newsletter, written by Elisa Valade and published October 1, 2015. On September 16, 2015, the Alberta Biodiversity Monitoring Institute (ABMI) hosted their first Ecosystem Services & Biodiversity Science Symposium: an engaging series of presentations showcasing the emerging knowledge of ecosystem services and biodiversity. 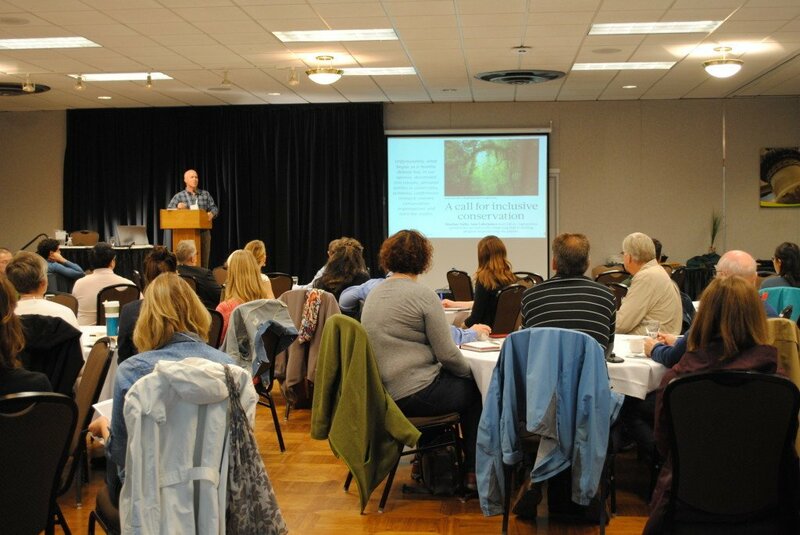 The symposium hosted experts from varying backgrounds to present on key topics and cases related to ecosystem services and biodiversity across Alberta, Canada and the Globe. How do you define the value of nature? Instrumental Value – Nature is valuable because of the extensive benefits it offers to humans. Similar to Marvier and Wong (2012), the findings were the same in our audience as the “moderate environmentalists”: half the guests identified with the definition for instrumental value and the other half with intrinsic value. The fact is: everyone (including our 8 speakers) has a different idea of the value of nature and which benefits are most important. The discussions throughout the day, however, highlighted why understanding this instrumental value is important for the provision and protection of ecosystem services. Robin Naidoo of the World Wildlife Fund presented a set of international case studies including examples such as biodiversity’s effect on ecotourism in Uganda, the relation between sea otters and tourism on Vancouver Island, Biodiversity and community based natural resource management in Namibia, and elephant conservation efforts in Africa. The examples were used to illustrate the methods, results, and issues that economic valuation of biodiversity raises and to support Robin’s key message: By borrowing methods from economics, we can shed greater light on the values or benefits associated with biodiversity conservation. Hitting the ‘sweet spot’ for ecosystem services assessment: how complex should our data models be? Dr. Ken Bagstad of the U.S. Geological Survey had the audience thinking about how our choices in data and modeling tool selection affect the results we get. Ken explored the idea that many modeling tools have steeper learning curves, reduced flexibility, and vary in complexity, time and technical requirements as well as scientific accuracy. Ken provided examples such as biophysical modeling in the Colorado Rockies, and run off modeling in Hawaii to demonstrate that various modeling approaches address different needs for decision makers, and to encourage us to think of and understand the consequences of the modeling approaches we choose. A point I found particularly interesting to learn more about was the World Bank WAVES (Wealth Accounting and the Valuation of Ecosystem Services) Program. An eight-country program to help countries more comprehensively track economic progress, through es mapping, modeling, valuation and accounting. Dr. Jessamyn Manson from the University of Alberta presented her work on native bees as an on-the-ground example of how we assess ecosystem services across Alberta. Dr. Manson familiarized the audience with research on systematically surveying native pollinators in agroecosystems across the province. The research is a step toward understanding the relationship between native bees and agroecosystems, and how linking pollination services to economic benefits might encourage environmental stewardship. This presentation highlighted the need for robust, credible research to generate the data for ES modeling. “The problem is land use, and the solution is land use.” Tom Habib, research coordinator with the Alberta Biodiversity Monitoring Institute shared his work in developing a set of spatially explicit models to map the supply and value of different ecosystem services including: water purification, forest timber production, carbon storage, rangeland forage production, crop pollination, and biodiversity. What makes these models different from others is the fact that they are integrated and able to measure how change in one ES might impact another ES. Tom explained that this suite of models can be used to explore the value of ecosystem services under different land-use management scenarios, and understanding the values provided by our landscapes will allow us to make better decisions about how we use and manage our lands. Majid Iravani discussed his work with the ABMI on the development of the Grassland Carbon model. Currently, a comprehensive dynamic tool for provincial-scale assessments of grassland carbon is needed, and the ABMI is working to create the first of its kind in the province. Majid explained the importance of this tool, as it could help us understand how land-management choices might impact grassland carbon sequestration in Alberta. Can we rescue PES as a tool for sustainability? Kai Chan of UBC’s Institute for Resources, Environment and Sustainability guided us through a discussion on Payments for Ecosystem Services (PES) highlighting that, while PES may be a good tool for sustainability, current designs are significantly flawed. In fact, he asserts that due to such issues as misplaced responsibilities and limited applicability (to name a few) current PES designs may actually be counterproductive to the goals of sustainability. Chan presented a new model as a way to ‘rescue’ PES as a tool in the conservation of ecosystem services. According to Chan, some of the key ideas this new model would be based on include: rewarding stewardship, paying the steward, and ensuring the responsibility is placed appropriately. Nothing in ecosystem services makes sense, except in light of evolution. Dr. Andrew Hendry of McGill University discussed the strong connection between ecosystem services and contemporary (or ‘rapid’) evolution, stating that all ecosystem services are here from evolution and all current evolution affects current and future ecosystem services. In this thought- provoking discussion, Dr. Hendry explains that what we now need to know is the extent to which evolution shapes ecological dynamics at the population, community, and ecosystem levels. The final speaker of the day was David Hill from the University of Lethbridge. Hill states that it remains a challenge to meet the environmental, social and economic needs of Albertans, especially in the face of economic development and its impact on Alberta’s natural resources. According to Hill, the goal is to seek out the best “fit-for-the-future” solutions to these challenges. The presentation explored how this can be done by recognizing what we already have done. There is much research that has been developed in Alberta already which can be capitalized on for the use of market activities that can both improve environmental performance and economic development. Watch all the presentations here!